One of the highest costs for running a commercial pool is paying to warm the water. What if you heated that water for free instead? 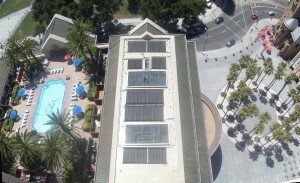 Solar rays are plentiful in California and that makes it the best location for solar swimming pool heating systems. And Solaron is the California leader for installations of one of the finest systems available – Heliocol water heating solar panels. The State of California created a generous rebate program for business customers with multi-family pools. This rebate minimizes a large percentage of the price of installing a solar swimming pool heating system. Other rebates are often available from additional agencies. When you purchase a solar swimming pool heating design from Solaron of Sacramento, we handle the complete project from start to completion. First, you receive a free consultation and quote at your property in Vacaville. Second, we design, engineer and purchase the permits for your installation. Finally, we build the swimming pool heater to your satisfaction and make certain that you procure all applicable rebates. All you do is sit back and save money! To begin the process of installing your solar swimming pool heater, call Solaron today at 916-631-9293.